MSS Inc. 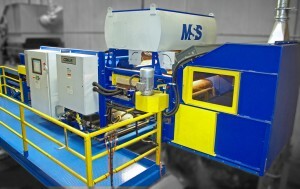 Releases New Optical Sorter- CIRRUS™- New High-Resolution NIR, Color and Metal Sorting System | MSS, Inc. The CIRRUS™ is MSS’ latest generation of NIR, color and metal sensor technology. It provides automated separation opportunities from single stream to construction and demolition MRFs; as well as plastics, paper, and electronic scrap recycling facilities. The CIRRUS™ accurately sorts targeted commodities using advanced identification algorithms and corresponding precise high-pressure air jets. It can be easily configured by the operator via a touchscreen interface and is offered in various sizes between 1200mm (48”) and 2400mm (96”). The exact sensor configuration is tailored to the specific processing application. For example, an all-metal detector for ferrous, non-ferrous and stainless steel can be added, as well as for wood, for further sorting applications. The CIRRUS™ will be offered in conveyor and slide configuration. MSS is a division of the CP Group. The CP Group designs and manufactures material recovery facilities and recycling equipment for Single Stream Recycling, Construction and Demolition Waste, Commercial and Industrial Waste, Waste to Energy, Municipal Solid Waste, eWaste and more. For further information, please visit www.mssoptical.com, email info@magsep.com, or call 615-781-2669.